Drip tubes made of high quality polyethylene is the backbone of any drip irrigation system. It carries the water from the source to the plants after which the the water is released by emitters, drip lines, sprayers, or sprinklers. Emitters can be manually inserted directly into poly mainline tubing with the help of a punch. Datta Irrigation drip tubes are UV stabilized, long lasting and can endure environmental effects. Suitable for areas that have acute scarcity of water. Suitable for rows of plants or landscaped areas. Used as laterals in drip irrigation system. Used in greenhouses for high pressure foggers, sprayheads and jets application. It is economical and efficient to use drip tubes in irrigation of almost any plant life. 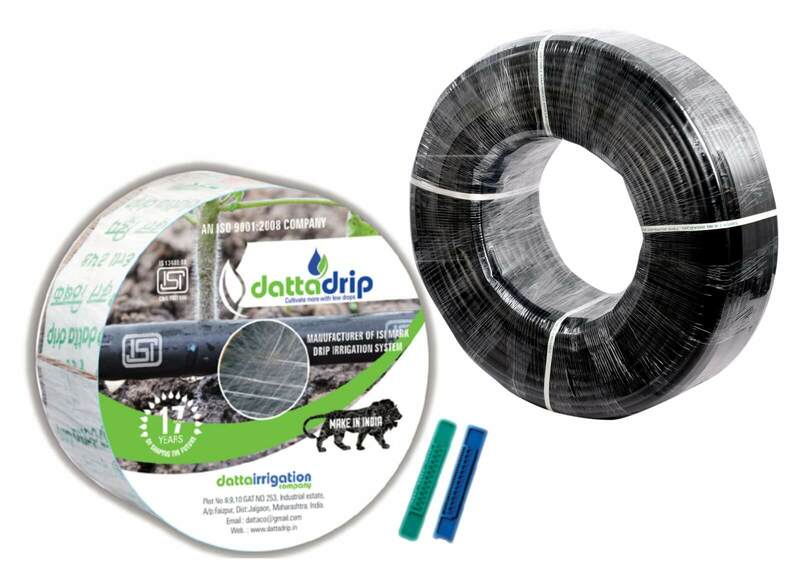 Owing to low flow-rate and direct application to the roots of the plant, Datta Drip Tubes help reduce evaporation and runoff. Each and every product is a labour of research, testing and high quality precision output. There is 24×7 after sales service provided for each and every product to ensure continuous support to the farmers.